If you’ve ever tried to give up carbs, didn’t you end up missing pasta so much? One way not to miss it so much is to create dishes like this one, where the lasagne noodles are replaced by vegetables with low starch and sugar content. Of course, you can replace the vegetables with actual pasta, but this is a great way to get kids to eat veggies. In a sauce pan, saute the beef and season with salt and pepper. Cook until meat is browned. Add in onions, garlic, thyme and bay leaf cook until fragrant. Add in the tomato paste, stir well and cook for another minute. Pour in enough water to cover the beef and simmer until almost dry. 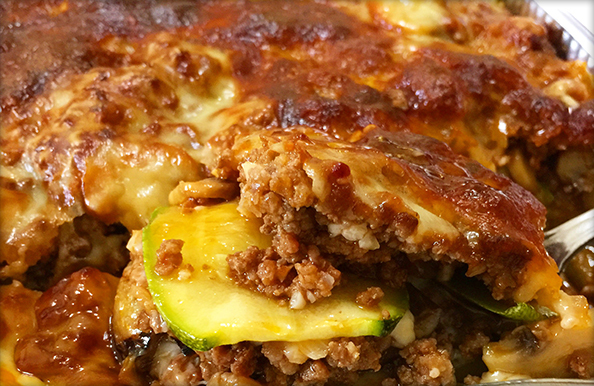 In a baking tray, layer half of the zucchini to completely cover the pan in a thin layer. Cover with a thin layer of the beef mixture and then some cheese. Cover that with a layer of eggplant and then like before, some beef and then cheese. Repeat another layer of zucchini, beef and cheese. Bake in a 200 degree C oven for 30-40 minutes until the cheese on top is golden brown.